The Earned Income Tax Credit (EITC), which provides low-income taxpayers with a refundable tax credit that increases up to a certain point along with wages, has garnered bipartisan attention over recent weeks for its ability to encourage work. The credit has been around since the 1970s, and throughout its history has generally been supported by members on both sides of the aisle. In a report released last week that was generally skeptical of many overlapping anti-poverty programs, House Budget Chairman Paul Ryan concluded that the EITC was effective at increasing labor force participation, rewarding work, and raising millions out of poverty. Greg Mankiw, the former Chairman of the Council of Economic Advisers under President George W. Bush, wrote an op-ed arguing that raising the EITC is a better way to help low-income individuals than raising the minimum wage. 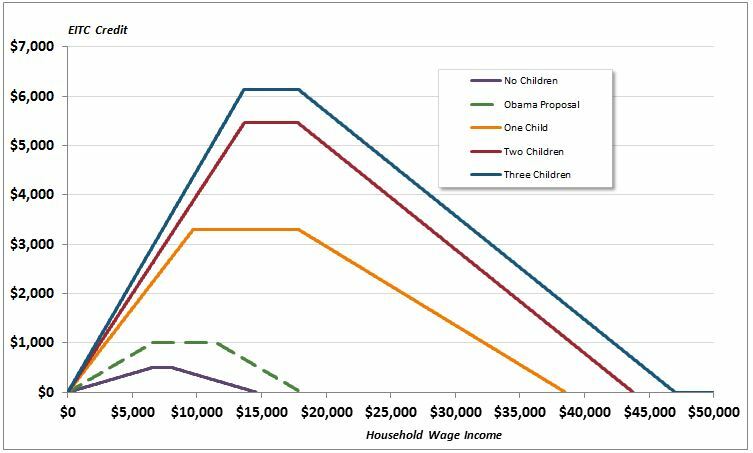 Many Democrats have also recently promoted the EITC as an effective way to encourage work and address poverty. Treasury Secretary Jacob Lew said in a statement earlier this year that "the EITC is a valuable program that lifts millions of families above the poverty line each year," and that "making the EITC available to more low-wage workers without children by raising the maximum credit they can receive is an important part of our effort to restore the middle class." Lew also penned an editorial in Politico this week reaffirming his support for the EITC, stating that the EITC is "one of the most effective anti-poverty programs we have seen," and that it "helps about half of all parents at some point." This broad-based support has translated into multiple specific proposals in the last months. Senator Marco Rubio, Ways and Means Chairman Dave Camp, and President Obama have each put forward proposals to reform the EITC. Enacted in 1975, the EITC provides low-wage workers with a refundable tax credit (meaning they receive the value of the credit even if they owe no taxes) that grows with income up to a certain point. In the years since, it has been expanded numerous times under presidents of both parties, most recently as part of the 2009 stimulus package. At very low incomes, the credit increases along with wages, effectively increasing take-home pay for these workers and encouraging them to work. The credit provides different levels of benefits and phases out at different income thresholds based on the number of children a worker has. Currently, eligible taxpayers with no children can receive a maximum credit of $487, and taxpayers with three of more children can receive the maximum credit of $6,044. The credit starts phasing out at $7,970 ($13,310 for married filers) for childless taxpayers, and $17,530 ($22,870) for taxpayers with children. In 2009, the American Recovery and Reinvestment Act expanded the EITC for married couples and for families with three or more children. These expansions expire after 2017. In the State of the Union, the President spoke about reducing inequality and helping families through the EITC, and called for strengthening the credit. His FY 2015 budget reflected these statements; he proposed making permanent the current expansion for families with three or more children, as well as expanding the credit for childless workers. For childless workers, the President proposes doubling the maximum credit and raising the beginning of the phaseout range to $11,500 ($17,000 for joint filers). He also proposes to expand eligibility for the credit by expanding the ages of eligibility from 25-65 to 21-67. As part of his comprehensive tax reform proposal, Chairman Camp proposed both enhancements and reductions in the EITC. He would make the credit refundable against payroll taxes, as opposed to income taxes. This provision would not alter the witholding amounts of payroll taxes, and would be administered as a credit when an individual files income taxes. Camp would also increase the phaseout levels to $20,000 for single filers with children and $27,000 for joint filers but reduce the amount of the credit for all beneficiaries and index those amounts to the more accurate chained CPI rather than the typically faster-growing CPI-U. Senator Marco Rubio recently proposed replacing the EITC with a low-income wage subsidy. He describes it as an enhancement for low-wage jobs that provides an "enticing alternative to collecting unemployment insurance." While there aren’t many details available about Senator Rubio’s proposal, like the EITC, low-income wage subsidies generally aim to increase the monetary return to low-wage work, although they would likely be delivered as an enhancement to each paycheck rather than all at once at the end of the year. The EITC is the fifth largest tax expenditure (costing $67 billion in 2014 and nearly $680 billion over the next ten years) and one of the government's largest anti-poverty programs. For comparison, the child tax credit will cost about $590 billion over ten years, Temporary Assistance for Needy Families will cost about $170 billion, and Supplemental Security Income will cost $635 billion. As tax reform discussions continue, Congress will have to seriously consider how best to deliver the EITC's benefits. This post was updated March 11 to better reflect Chairman Camp's EITC proposal.